Cockatiels are among those species of birds that are as companionable as a dog. Their gentle disposition and loving nature make them quite popular as pets not just for avian enthusiasts but for families as well. A Cockatiel is a bird that can perch on your shoulder without giving you a nip! However, how you keep your Tiel can have a dramatic impact on its behavior. You can’t expect your Tiel to maintain his sunny disposition if he doesn’t live in a comfy place he can call his own. That is why you need to find the best cockatiel cage for your avian friend. So, we prepared a list of the 10 best-selling cockatiel cages in the market. Otherwise, you will be choosing among a sea of products! Our picks are based on several key factors including size, construction, and customer feedback – ensuring that your birdie lives a happy long life with you! Your winged friend will be spending most of his life in an enclosure, so you might as well get the largest cage you can afford. But if you want numbers, the Center for Animal Rehab suggests 20” x 20” x 24” for each Cockatiel. Don’t forget that is only the minimum guideline. 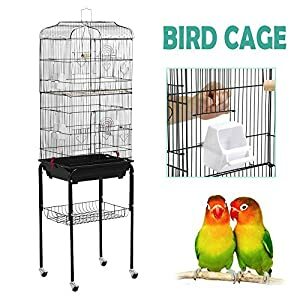 A large enclosure ensures your Tiel can freely move around, stretch his wings, and have a great time playing his toys even when you’re absent. With a big cage, you can hang walking logs, climbing apparatuses, etc. All these are barely possible if you choose a small crummy cage. Not to mention you need to furnish the cage with several key components such as a watering station and a feeding area. A majority of us still have this outdated assumption that a rounded cage is the best cage shape for our pet birds. However, a rounded cage can only chafe your bird’s feathers due to the constant contact with the metal bars. That is why rectangular cages are more preferable. Horizontal space matters more to birds than vertical space. They fly forward and back, not up and down like a helicopter. Having said that, you need an enclosure that is longer rather than higher. However, a combination of the two would be best. Cockatiels enjoy climbing up the sides of their cage using their beak and claws. That being said, a cage with horizontal bars will be more ideal as they appear ladder-like. Likewise, consider the correct bar spacing of the cage. For Cockatiels, we recommend nothing bigger than 0.6”. Maintaining a Cockatiel cage is not a pleasant task, especially if the cage is poorly designed. You will be topping up the food and water regularly; thus, you need a cage that has a built-in feeding door for a quicker and much safer food and water deposits. The more access doors a cage has, the better. The cage must have at least one opening that your bird will fit through. Of course, the door must have a locking mechanism to make sure your pet won’t break away from his cage in the middle of the night. Lastly, choose a cage with a removable floor to make cleaning a lot easier. Some Cockatiel cages are equipped with stands that have pivoting wheels for portability. 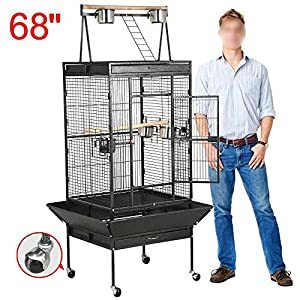 If you want your birds to live in a massive cage, it would be wise if the cage comes with casters just in case you might need to transfer it from one room to another. But if you are looking for something smaller, a cage with a top handle would be ideal. Some Cockatiels are part-mouse and they will start biting into their cage. So, if you have a cage that is made with harmful substances, then your pets could be in danger. The best cage is made of stainless steel but it is not often used because it is too expensive. A great alternative is a cage made with wrought iron finished with powder-coated paint. A cage made with wrought iron is "roughed up" through either sandblasting or an acid wash, followed by a powder type paint to give it a very long-lasting, durable finish. Toxic substances include brass and galvanized steel due to the presence of lead and zinc. Our first choice is the 3151BLK by Prevue Hendryx, which highlights a robust wrought iron construction finished with a non-toxic and pet-safe powder coating. It is available in Black Hammertone, Chalk White, Cobalt Blue, Coco Brown, Garnet Red, and Sage Green. 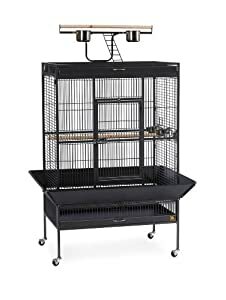 The cage measures 36” x 24” x 66” and would be an excellent choice for a pair of Cockatiels. With a straightforward set of instructions, you can put the cage together in 30 minutes or less. Additionally, you will receive a grille, a seed guard set, two wooden perches, four stainless steel cups, and two metal trays with the cage. The 3151BLK also comes with a playtop where your birdie can exercise his freedom. Likewise, the playtop lends a cool shade for your pet. 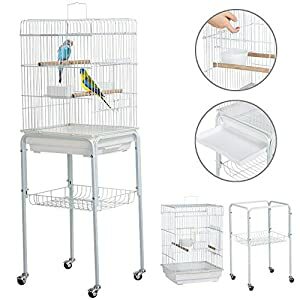 Should you need to move the cage from the veranda to the living room, you can always do it with a push since the cage has casters. What’s more, the cage features a sturdy push-button lock to make sure your winged friend won’t get out between playing sessions. Apart from its locking system, the design of the cage itself is pet-proof. No pets from the outside can get in to vex you bird. With its build quality, numerous features, and affordable price, there is no question that the Prevue Hendryx 3151BLK Wrought Iron Select Cage is a best seller! 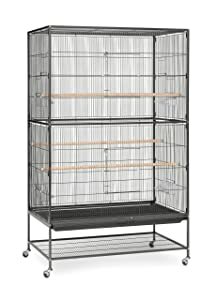 Another product that deserves a slot in your shopping list is the Yaheetech 52” Bird Cage. This cage boasts of a premium iron frame construction, which is finished with a silver anthracite powder coating for increased durability and aesthetics. It measures 30.8” x 20.5” x 52” and because of its sizeable dimensions, this unit is capable of accommodating two Cockatiels. Don’t worry because the cage still features enough room for your avian friends to cozy up. The manufacturer also wanted to make sure their buyers have no difficulty accessing the cage so they designed it with two front doors. Adding to that are rugged pivoting wheels for portability. The casters are two-inches thick, making sure it can bear a good deal of friction. There is also a slide-out tray to contain the mess inside the cage. A removable sand tray, three wooden perches, and four large feeding trays are also included with the cage. The Flight Cage by Prevue Hendryx is another model you might want to consider. The cage measures 26” x 14” x 36”. It's a perfect fit for a Cockatiel while allowing enough room for perches, toys and playroom. It comes with two cup feeders with covers to prevent bird droppings from spoiling the food and water. It also has four horizontal perches. The cage has horizontal bars on the left and right side of the cage, as well as vertical bars on the front and back. Hence, you won’t have trouble attaching your bird feeders. 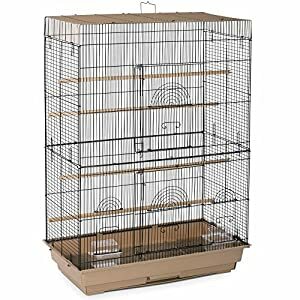 Moreover, the cage features four doors that slide up: two where you place the feeder cups and two on the center. The two in the center are part of two large doors that have a locking mechanism. The bottom of the cage has two sliding areas to put the grill and tray. The top of the cage is removable too in case you want your birdie to have some fun. Overall, we felt the price was great for the cage and the colors are perfectly muted. Its assembly is a piece of cake; you don’t even have to look at the instructions. 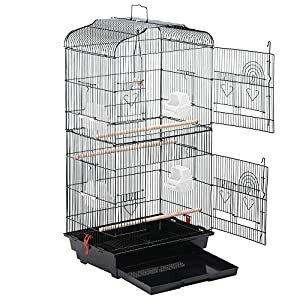 The extra-large F040 Flight Cage by Prevue Hendryx is a castle of a cage befitting a majestic Cockatiel. It measures 37” x 23” x 60’ and has a 0.5” bar spacing. You will need something this large if you are a proud owner of a whole flock. A cage this big ensures your avian friends can keep their wings moving back and forth, rather than getting their crest and tail feathers frayed by a cramped cage. Adding to that are three wooden perches for your pets to hang out and four plastic cups so your birdies will have many areas to feed. The cage also includes a spacious storage shelf for storing pet supplies and other practical items. Initial setup is easy. The stand is integrated with pivoting wheels so the whole thing is a single unit. This cage is also equipped with a removable grate and tray to make cleaning as hassle-free as possible. The Yaheetech 47” Small Rolling Bird Cage a wonderful choice if you are looking for a temporary shelter for your avian friend while his cage is being cleaned. This dainty looking cage features a solid construction of metal and plastic components. It is not easily bent or damaged and its metal frame is coated with white anti-rust paint for aesthetics and added durability. What’s more, this cage is portable. It also comes with a metal handle so you can hang it on a hook. Assembly is straightforward and it has a bottom shelf that you can disassemble anytime. Additionally, this cage comes with two wooden perches and food containers. Product dimensions are 15.9” x 14.5” x 46.5”. The Yaheetech 59.3'' Medium Rolling Bird Cage is an affordable starter cage for new bird keepers. It measures 36.2” x 18.1” x 13.9”. It is a pretty good size and yet it doesn’t take up a lot of space. However, the affordable price point means you will be getting a cage with a cheap plastic base. So, you may want to invest in a higher quality cage if your budget permits it. Nevertheless, this cage features multiple doors of varying sizes. The bigger doors are a great help for getting your bird in or out. The cage also has a sturdy top handle for easy carrying. Its top handle also allows you to suspend the cage from the ceiling or from a tree. Additionally, this cage has a bar spacing of 0.4”, making it safe even for tiny nestlings. There is also a spacious storage shelf in the bottom rack for keeping things organized. Lastly, it comes with three perches, four feeders, and a built-in swing. 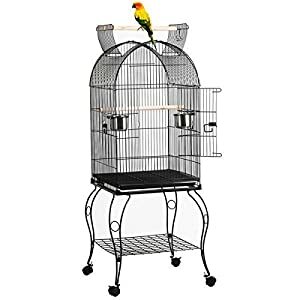 With plenty of entertaining features, the Yaheetech 68” Wrought Iron Rolling Bird Cage serves as both a jungle gym and a home for your birdies. 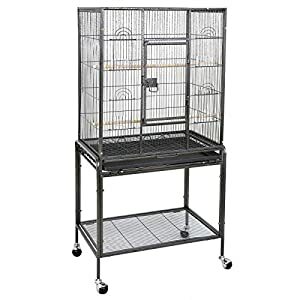 This cage measures 31.5” x 30” x 68”, which is big enough for a pair of Cockatiels. This cage comes with a ladder, a wooden perch, and three stainless feeder bowls. As you can see, this cage has a playtop for your birdies to hang around. It also has a seed guard so your pet can't throw his dishes around like a possessed bird when he's mad. Likewise, there are three lockable feeder doors to make feeding or cleaning a hassle-free task. The price point can’t be beaten for a cage this size with a seed guard. As for safety, you can lock the huge front door to ensure your winged friends are secure inside. The bar spacing of the cage is 0.6”, which is enough to keep bigger pets from preying on your birds. Moreover, keeping this cage sanitary is made easier with its detachable mesh panel and slide-out tray. Also, the cage has four industrial-quality casters so you can conveniently transfer the cage anywhere in the house. Take note that the manufacturer uses non-marking casters for this model, which is a relief as they don’t smirch your floor. However, do not put a destructive bird inside because he will probably break the bars. The cage is not among the sturdiest ones but considering its list of features, it is priced very well and you certainly get what you pay for. Opting for a low-priced cage won’t make you an irresponsible pet owner. Sometimes, it is just the wisest thing to do! Whether you need a back-up cage ASAP or if you’re still saving for a posh cage, the best budget cage you could get your hands on is the Yaheetech 36” Portable Bird Cage. 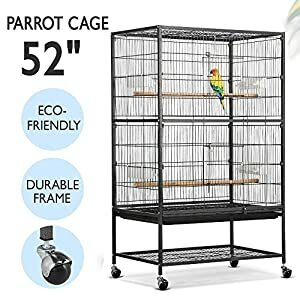 This cage measures 36.2” x 18.1” x 13.9” and so, it is spacious enough for a pair of Cockatiels. Although it’s pretty big, the cage has a small footprint that can fit almost anywhere – from the living room end table to the kitchen countertop. The cage comes with a top handle to make it easy for you to move the cage. In addition, this cage comes with four feeders and a slide-out tray. The cage also has multiple doors to make feeding a lot easier. This beautiful cage by Yaheetech highlights a high-quality metal frame finished with a non-toxic epoxy paint for aesthetic enhancement and increased corrosion resistance. The cage has a detachable design, which is quite handy for traveling or when used as a back-up cage. This cage comes with two timber perches and two stainless steel feeders. You may install the timber perch on top of the cage for your winged friend to relax on. There is also a slide-out plastic tray for easy cleaning. The ZENY 53” Bird Cage is crafted using powder-coated wrought iron. It may not be the toughest cage out there but it is definitely strong enough to contain your Cockatiel. It features 0.5” spacing between the bars and has a secure lock on its door, which is good news if your pet is part-Houdini. Measuring at 25.2” x 17” x 53”, this cage is big enough for your winged friend to live comfortably. Inside, you will find two wooden perches, four plastic cups, and a removable sliding grate. The cage is set on four heavy-duty casters, which allows the cage to be conveniently transported anywhere in your home.